Minnesota State Arts Board, Artist Initiative Grant, Visual Arts, 2017. 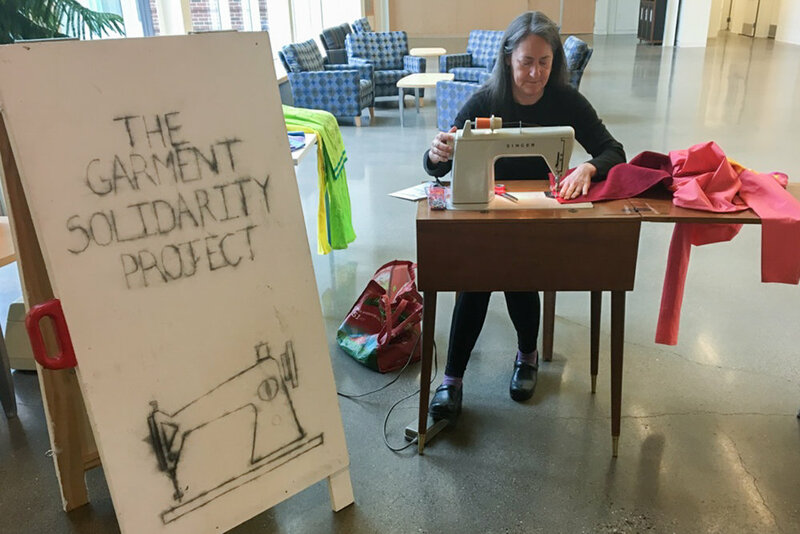 The Garment Solidarity Project expresses solidarity and empathy with garment workers around the world through the metaphoric act of sewing clothes for the women who sew our clothes. By sewing the common clothing of Bangladeshi garment workers, the shalwar kameez, in public, I aim to convey an act of solidarity with these workers. I also hope to raise critical questions about how our clothes are made. By creating an interactive, temporary art installation in public, the “making” process becomes an act of connection with garment workers in Bangladesh, and embeds questions about how our clothes are made into the finished works. I am inspired to make work about the people who sew our clothes to bring to light our connections to these workers and to encourage critical dialogue about the globalization of the garment industry. The conversations I have with people become a medium and help to create a context of "public making." With this work I seek to amplify and honor the past and also inform the present. Rachel Breen is a fiscal year recipient of the 2017 Artist Initiative Grant from the Minnesota State Arts Board. This activity is made possible by a grant provided by the Minnesota State Arts Board through an appropriation by the Minnesota State Legislature General Fund and the arts and cultural heritage fund, and a grant from the National Endowment for the Arts.